Relations between Europe and Russia may be rocky on Earth, but next month's planned landing of a module on Mars — a first step in the broader search for life on the Red Planet — shows that cooperation in space is another story. In a joint mission between the Paris-based European Space Agency, or ESA, and its Russian Roscosmos counterpart, the Schiaparelli module is expected to touch down Oct. 19 on Mars, paving the way for a second, ambitious mission in 2020 to dig for life underground. "Nobody really knows what's going on under the surface and this is really the goal of this mission," said Fabio Favata, coordinator of ESA's science and robotics exploration program of the ExoMars venture. If the United States has long dominated Mars exploration — NASA has already launched a number of missions to the planet — the European collaboration with Russia aims to mark the first exploration for life below ground. That is expected to happen during the second phase of the ExoMars mission four years from now, which will include launching a rover equipped with a drill to dig two meters under the Martian surface. At that level, scientists believe, any traces of bacterial life, past or present, could potentially exist, undamaged by powerful UV radiation. According to Favata, "Nobody expects there's life on the surface of Mars," where the planet's thin atmosphere and lack of magnetic field make conditions inhospitable. "If there has been or still is life, it would most likely be underground." Launched in March from a base in Kazakhstan, the first phase of the mission includes an orbiter that will analyze methane and other gases in the Martian atmosphere. It includes the Schiaparelli probe, whose scheduled landing next month aims to solve a tricky question: how to land a rover successfully on Mars. In 2003, its Britain-supplied lander Beagle 2 went missing. It was discovered on the planet last year, indicating it had indeed landed but failed to properly deploy its solar panels. "Getting to Mars is difficult. It has a bit of atmosphere but not enough," Favata said. "You really need to use all possible means" to touch down. Composed largely but not exclusively of European Union states, ESA's 22 members individually account for the lion's share of its $5.89 billion budget in 2016 — a figure dwarfed by NASA's $19.3 billion budget for the year. While the agency is not part of the EU, Brussels nonetheless remains ESA's biggest single contributor, earmarking $1.5 billion for ESA this year. 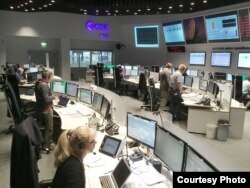 The European agency will not be alone on Mars. Both China and NASA plan to send rovers to the planet in 2020, while India circled an orbiter around it in 2014. ESA's own 2003 Mars Express Mission — a collaboration with NASA that has mapped the planet's surface — is still ongoing. Meanwhile, U.S. technology company SpaceX is eyeing an astronaut touchdown on the Red Planet in 2025, an ambition that ESA astronaut Leopold Eyharts suggests will be daunting. "We have some issues we don't know how to deal with at the moment, like radiation," he said of manned space flights. "If you put someone out of Earth more than a few days, you get problems." October's Mars landing will come just after ESA completes its Rosetta space probe mission, which marked the first landing of a probe on a comet. Earlier this month, the space agency located Rosetta's missing Philae probe, two years after its bumpy landing on comet 67P. That, says Favata, "was a beautiful piece of news."